It doesn’t matter if you’ve been installing ceramic floor tiles for a few years now or if this is your first project. You can’t deny that there’s a beauty to this material that can add a certain charm to any room, whether we’re talking about the kitchen, bathroom or living room. Ceramic tiles are mesmerizing, durable, and require little maintenance. In fact, you can visit a three hundred years old church or castle, and you can find ancient tiles that are still telling their history to their visitors. Wouldn’t it be wonderful if you could install floor tile that would last for generations to come? The thing is that, as durable and versatile as this material can be, installing ceramic tiles is a complex job that requires special care and preparation. You can’t tackle this project without a clear plan, excellent prep work, and a lot of patience. Rush through it, and the tiles won’t survive the sudden spills and constant wear and tear. Learn how to install them properly, and you can take advantage of their strength and durability. With that in mind, here’s a comprehensive guide that will teach you how to install ceramic floor tiles that will last for years to come. First thing first: carefully inspect the surface upon which you plan to install the floor tile. Keep in mind that as strong and durable as ceramic tiles may be, they will crack if the subfloor is uneven or thin. As a rule of thumb, make sure that the subfloor is no less than 1 1/8 inches thick. Otherwise, it may flex, causing the grout to fail and the tiles to break. If you’re not sure whether the base is sturdy enough, then you should jump on it. Yes, it may sound silly, but it’s an excellent way to determine if there’s any flex or movement. A concrete slab is an ideal base for a floor installation project, but wood can work as well, as long as it’s firm. After assessing the sturdiness of the subfloor, you then need to ensure that the surface is smooth and flat. Trying to install floor tile against a protrusion will result in a sloppy-looking project that won’t pass the test of time. Before you can begin the actual installation process, you need to figure out how much ceramic tile you will need and how you should place it. You want the final result to look smooth and symmetrical, so you need to find the center of the surface on which you will be installing the tiles. Once you’ve identified the starting point, measure the surface from the sides. Pay special attention if the floor isn’t square because identifying the baseline won’t be as obvious. Try to find the most distinct wall and use it as the starting point. That way, people will see the lines parallel to that wall, making your work look even and symmetrical. The next step you will need to take is to estimate the amount of ceramic tile you will need. You can do that by using a simple math equation: calculate the square footage of the room and add five percent for waste. If you think that the prepping work is over, then you have another thing coming. Although you may be eager to start laying the ceramic floor tiles and see your vision come to life, you need first to ensure that the layout will be even. So, before you begin setting the tiles in place with mortar, dry-fit them over the surface to determine whether the layout is even or if you need to make any adjustments. Make sure that the space between the tiles is uniform. Resist the urge of pushing tiles close together to reduce the width of the grout lines. Especially if you have large ceramic tiles, then the space between them should be large as well. Otherwise, the grout won’t bond properly, and it will break down prematurely, thus leading to potential leaks and water damage. Now that you’ve determined the layout, use a pencil to mark the outer edge of the tiles so that you know where to position the furring strip. This step will provide an accurate overview for when you will set the tiles in place with mortar. A dry layout enables you to see how the final result will look like and if there are any adjustments that you need to make. For instance, you may notice that you need to cut some of the tiles to make them fit the surface properly. You can choose to cut the tiles before you set them or to install the full-size plates first, allow them to dry, and then add the cut ones. Because cutting ceramic floor tiles is a complex and delicate job, you must ensure that you have the right tool in your arsenal. 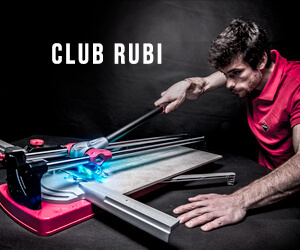 A tile cutter from RUBI specifically designed for ceramic tiles will ensure that your cuts are clean and accurate. If you decide to cut the tiles as you go, then you will need professional tile saws, like these here. These portable tile saws are excellent for projects that require you to make the cuts directly at the place of installation. Needless to say that precision is of utmost importance, so you will need tools that offer the highest accuracy and quality. The prepping part is finally over. Now begins the part where you can install the tiles and turn your vision (or the client’s vision) into reality. Consider the room where you will be installing the ceramic floor tiles. If we’re talking about kitchen, bathroom or hallway, in other words, rooms that are prone to moisture, then make sure to use a waterproof adhesive. Check the label to determine how long it will take the adhesive to dry. Communicate the drying time to your clients as well and let them know that they should avoid walking on the tiles during this period. Otherwise, they might damage the bond between the tiles, causing them to loosen and the grout joints to crack. Mix the thin-set with the adhesive until you get a mayonnaise-like consistency. Let it rest for about ten minutes before you spread it on the surface floor. Use a trowel to spread a thin layer of thin-set. Hold it at a 45-degree angle to smear the mortar evenly and ensure there are no bulges or gaps. Lay the tile gently over the thin-set. With your fingertips widespread, push the tile down to set it in place firmly. Twist your wrist slightly as you do so to spread the adhesive over the surface of the tile. Begin from the center of the room and move towards the walls. Apply constant finger pressure as you go to avoid lippage. We truly recommended you to use Rubi Tile Level Quick. This leveling system is ideal for installing large format ceramic tiles (minimum size required: 12”x12”) and thickness levels between 1/8” and 5/8”, by using the double gluing technique. The nippers allow pressure to be adjusted according to the thickness of the ceramic tile, allowing the user to always exert the exact pressure necessary at all times and this facilitating the use of the system for users who are not accustomed to it. Thanks to the TILE LEVEL QUICK, the ceramic tile installer sees how work time is reduced and the profitability of installation work improves, both floor and wall tiles. Once the adhesive is dry, you can begin preparing and applying the grout. Mix it until you obtain a smooth yet firm paste. Spread the grout evenly and use a blunt stick to force it between the joints of the tile. Use a big sponge and water to remove the excess and give the floor tile an even look. Keep in mind that this part is very painstaking and you will need to wash the surface several times to obtain the result you were hoping for. After the grout has dried, use a dry cloth to buff the tiles. Use vinegar to remove any dirt or haze. Last but not least, apply a grout sealer to ensure everything will be kept in place. After several days of hard work, your job is complete. It was a difficult and demanding process, but the result is well worth it. Not only that, but because you’ve followed all the right steps, were patient, and didn’t skip any of the preparation parts, then you are confident that your ceramic floor tiles will last for years to come. Give yourself a pat on the back. You deserve it. Just like the mosaics from ancient architecture, your floor tile is a work of art. And, it will probably last just as long!